Friends, It's now time to discuss and share the answers for previous years CEED question papers. For most of the PART-A questions, solutions were clearly explained. Part - B requires yourself to be involved; however some ideas and sketches were given in the page - NID/CEED Design part that might help you develop and create your own ideas. Like I mentioned in several parts of this blog; UCEED questions are similar to CEED Part A and in fact the difficulty level is higher. So, I've included UCEED solutions also in this page. Note: If you are preparing for UCEED, then consider solving CEED previous papers too! (Only Part A, not Part B (design part)). Those preparing for NID Design Aptitude Test (DAT), both parts are applicable! Can you even post the answers of ceed papers 2006 to 2011. If not complete solutions but atleast the answer key. You can find the pattern of CEED 2015 by going through CEED 2015 question paper available in CEED resource page of this blog! Haven't tried on that coz of time constraint, if somebody shares with me, I will upload that, you could also try answering them! ok sir, surely i will do it, but how could i show it to you? 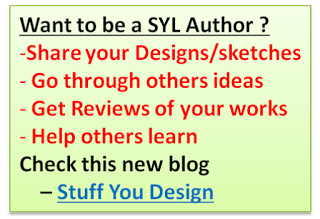 If ur works are worth shareable, then use the stuffyoudesign blog link (provided in the top right side of this post) to create and post your own content. It must be helping others also. Else, u can use my G+ profile to share ur works there. This is dhiraj, i am a fashion designer, i am preparing for ceed 2017, could you please tell me that what are the mathematical questions can be asked so that i can prepare in that way i am little week in mathematics what are the things i can prepare MAT preparation books can be ok, i am confident in creativity only i need help in mathematics, if you ll tell me that also i ll try to solve and i am sure i ll do. Lastly, I want to ques you! since you are a fashion designer/student, are you applying for NID or not ? since I know NID fashion design courses are available but mdes through CEED doesn't offer an fashion design courses essentially! so just curious and let you know if you don't know about it, I think if u better look into that (NID design courses) too! do i need to carry colors for exam ??? Is the question paper of 2018 will be tough than 2017 and easier than 2016? uceed/ceed nid ug/pg and nift ug/pg sylabus are same ? and what is differences? first u neeed to clear urself - are u giving exam for bdes or mdes?, coz uceed n ceed r not same exams u cannot give both! Could you plz post solved ques paper ceed 2011.
sir, can i get CEED 2015,16,17 part B que papers? my doubt is part B (optional) of CEED.can people attain any department question or if i am try for product design i should attain product design anything like that is there???? ?i checked in everything i didnt find an answer also if there is nothing like that then there is no necessary of say department heading at each question right!!! Just yesterday only I had shared a detailed answer to this ques in SYL FB timeline. Either you're not in fb or not following the blog updates! Anyway, I had copied that in this post. Check the reply to the 1st ques. Uceed is an computer based exam. Hello Bhanu, I am looking for NID and CEED previous year question papers with answers. Can you please post UCEED 2018 solutions? Hello Sir, How are you ? I have given a drop this year. And I want to crack UCEED and NID. Now I have 5 months left with me to make my future shine or regret after wasting my time. I want iitb at my first preference. I want your help so that I can achieve my goal. How to best utilize these 5 months ? I want to make sure that I give my best for the exam, so there should be no regrets after of not giving my best. At any cost of dedication, determination, perseverance I want to succeed. Please help me out in making my best possible schedule. And best way of preparing for exams. Hello Muskan, sorry for the delayed reply. Comments notification didn't appear in my inbox and so I couldn't check them. I really happy to see you determined. Hope you will shine bright. Anyway, I expect you've made some strategy by yourself and has been preparing to your full ability. Regarding schedule, I've given them in the following posts. If you need any further clarification, u can get back to me.